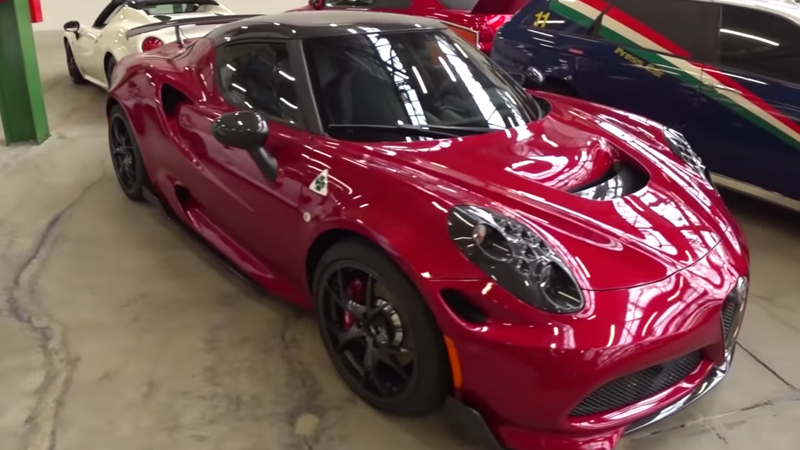 In the video we posted yesterday at around the ten minute mark, there’s a white and a red Alfa Romeo 4C with heavily revised bodywork and the signature four-leaf clover badge on the fenders, suggesting that at some point, Alfa Romeo was seriously considering a higher-performance version of its cute little carbon-tubbed, 1.75 liter sports car. As we mentioned yesterday, a higher performance 4C was once teased by a company executive, who suggested they could get more power out of the original engine and boost the brakes, but it just never seemingly came to fruition. While it is indeed sad that the was seemingly never enough push, neither from consumers nor company insiders to get a 4C Quadrifoglio into production, it’s still pretty cool that the company didn’t shy away from its consideration and now has the models out on display. If you already have a 4C and may be getting a little bored with it, now you have some inspiration on some light modifications you can make that will be at least decently OEM-accurate.